The belief that 'good triumphs over evil' resonates deeply in our psyche through religious, cultural, and political discourses. It is also a common theme in the entertainment media where the struggle between good and evil is frequently resolved through violence. The potential negative impact of media violence on children has long been a public concern. It is even more troubling when U.S. military violence, both in the news and in the entertainment, is often glorified as heroic and patriotic. Children's worlds of fantasy and reality collided when our political leaders, in response to the September 11th tragedy, simplified the complex international relationships into a fight between good and evil. 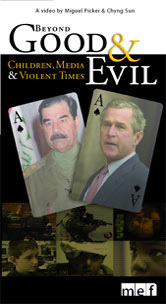 The Bush administration used the narrative strategically, and the news media perpetuated it with enthusiasm, pumping up patriotism and generating public support for the invasions of Afghanistan and Iraq. This video examines how the 'good and evil' rhetoric, in both the entertainment and the news media, has helped children to dehumanize the enemies, justify their killing and treat the suffering of innocent civilians as necessary sacrifice. The interviews include media scholars (Robert Jenson, Robin Andersen), child psychologists (Diane Levin, Nancy Carlsson-Paige), teachers (Merrie Najimy, Brian Wright), educators (Eli Newberger and Betty Burkes), and the children themselves.